For people with diabetes, many are fully aware of the physical symptoms associated with hypo events (shaking, sweating, dizziness, extreme hunger) and hyper events (blurred vision, extreme thirst, nausea). But people tend to pay less attention to the emotional and cognitive effects of low and high blood sugar. It’s just as important to understand and recognize the connections between your mind, body, and the role of sugar and diabetes. First let’s take a look at how the body uses sugar. Sugar, essentially a group of molecules you can define as carbohydrates, can come in many forms and you can find it almost anywhere in your diet – glucose, fructose, sucrose, and starch. In whatever shape you eat your carbs, be it cookies or a baked potato, after entering the intestine they are broken down into their simplest form glucose. They are absorbed into the blood stream via the intestine to be converted into energy. This is when the pancreas kicks in to secrete insulin to moderate the amount of glucose uptake. The glucose that is not used is then stored in the liver as glycogen. If your body needs more energy later on, your pancreas turns back on to release the hormone glucagon along with your adrenal gland with an added kick of epinephrine (adrenaline) to activate the immediate breakdown of glycogen to glucose. The liver also begins to make new sugar in in response to adrenal cortisol and pituitary response to hydrocortisone or growth hormone, respectively. In people with Type-1 Diabetes, their bodies cannot produce insulin because the beta cells of their pancreas are impaired or destroyed. For this reason, T1s will need to inject insulin to regulate the level of sugars in the blood stream and avoid the side effects of hyperglycemia. For people with Type-2 Diabetes, they do not respond well or have developed a resistance to the effects of insulin. While treatment for T2s may begin with oral medications in conjunction with diet and exercise, they may eventually need insulin injections to assist them to process sugar and prevent diabetes complications. In other words, what people with Type 1 and Type 2 Diabetes have in common is that they must take an automatic function of the body to regulate blood sugar and operate it in manual mode. The main fuel for our brains is glucose, so when our sugar levels are poorly managed the impact on our cognitive functions and mood is greatly affected. Surprisingly, while the brain only accounts for 2% of a person’s total weight, it consumes over 20% of your daily energy intake. When you chow down on a super sugary snack and get that energy boosting sugar rush in a hurry, it can quickly turn into a sugar crash. The neurons in your brain are unable to store glucose and your mind will experience a power emergency. Too low blood sugar can make you feel weak, confused, anxious, or just like you are in outer space. If your sugar levels are all over the place, this can be both physically and mentally exhausting without your even realizing it. Going bungee jumping with your sugars can put you on an emotional roller coaster. Changes in mood due to a hypo can include irritability, nervousness, aggressive behavior, and crying spells. Long term effects of unbalanced blood sugar can increase your risk for developing mood disorders such as depression and anxiety. Studies have shown that poor control of blood sugar can also lead to cognitive and memory issues. Too much sugar can lead to blocked membranes which slow down the communications between neurons. Realistically, it is not possible to always “control” your blood sugars and it is not always “controlled” by what you eat. Outside factors such as stress, changes in routine, and diabetes burnout can get you off track. At the end of the day it can be hard to figure out if high and low bloods sugars are caused by the “chicken” or the “egg”. Many people take for granted the things that our bodies do for us instinctively, so imagine how physically and mentally exhausting it can become to have to manage your blood sugars on your own. 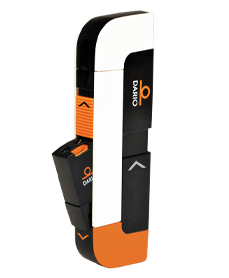 The Dario Personalized Smart Meter and Management System can help you track and take out some of the guesswork about managing your Diabetes. Awareness of your physical and emotional reactions is important to improving your balance of in-range glucose days. 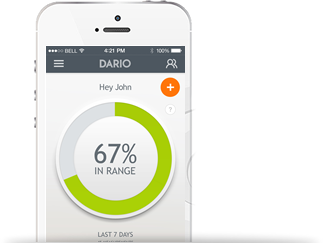 With your Dario personalized Smart Meter, after taking a BG measurement you have the option to tag your mood or make a note right in the Dario app. Overtime, you will be better able to recognize your hypo and hyper symptoms by the way you think and feel and help get your health on track.